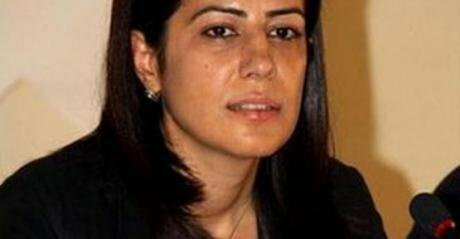 Ayla Akat, lawyer, former Peace and Democracy Party (BDP) MP for Batman, KJA Spokesperson and prominent Kurdish women’s rights activists based in Diyarbakir (Amed) was arrested a few days ago alongside other Kurdish women’s rights activists. The arrest of the co-mayors and women’s rights activists is part of the Turkish government's attempt to destroy local forms of governance and democratic structures with transparent processes. The locally elected municipalities have been very effective in providing welfare, access to resources and the requisite infrastructure to their populations, despite the multiple challenges imposed on them by the Turkish government and the extremely limited budget available to them. We interviewed Ayla Akat as part of our broader work on the gendered dimensions of the Turkish-Kurdish conflict. Ayla Akat has been involved for many years in trying to find a political solution to the Turkish-Kurdish conflict while defending the rights of the Kurdish minority in Turkey. She has also been at the forefront of addressing and struggling against gender-based inequalities within Turkey more broadly as well as within Kurdish communities more specifically. We wanted to know about the establishment of the Kurdish Women’s Congress (KJA – Congreya Jinên Azad) and her views on the stalled peace process. Nadje Al-Ali (NA) and Latif Tas (LT): Can you please tell us about the background to establishing a Kurdish Women’s Congress (KJA)? Ayla Akat (AA): Mesopotamia has played a key role in the history of world civilization. Sadly, it is also a place where oppression, war and conflict have continued for a long time. Especially in recent centuries, women have been more oppressed in the Middle East than in any other part of world. Women have been treated as objects. The Kurdish movement wants to end this oppression, and since the 1990s, women’s rights have been one of our most important priorities. There is not only oppression in the political arena, but it takes place throughout society, within the family, and in the work place. Women have been the subject of many kinds of oppression and brutality in almost every part of their lives. They have been treated as objects. Our aim, with the help of a range of new organisations, is to create institutions which empower women. We want women to take an active part in these, as well as making sure that we benefit from enhanced women’s rights across society. We are always keen to learn new things and to do new research about women’s rights; we want to know what is going in other parts of the world, and to understand different experiences. We are very keen to listen to new people, including academics, NGOs, and politicians. As part of this process, we organise workshops and conferences. They may now be trying to understand us, but I do not think that we have explained ourselves well enough to outsiders. At the same time as learning about what is going on in different places, we try to share our aims and experiences with outsiders. The subject of Kurds and the Kurdish women’s movement is not new, even if it looks very new to many parts of the world. They may now be trying to understand us, but I do not think that we have explained ourselves well enough to outsiders, and there are still many unknown issues. For that reason we set up the Kurdish women’s congress in 2015. But this follows on more than 25 years of experience for Kurdish women. The women sitting on the committee have been part of this experience in different roles. When you look at the CVs of the women just sitting here in the room, then you can understand what I mean. The creation of a women’s congress has also been one important element within the peace process. Mr Öcalan especially wanted women to be involved, and one of our members, Ceylan Bagriyanik, was our representative. We are the women’s congress. Unfortunately that peace process is now paralysed. But when it re-starts, a representative from the women’s congress will sit at the peace table. Unfortunately, we don’t have any legal foundation for the KJA, according to existing Turkish law. We have put all women branches under this congress, but there is no legal space for this, so we are registered as an association now. However, an ‘association’ is very limited and does not correspond to our aims. We are the women’s congress and we want to be registered as a ‘women’s congress’. NA & LT: We understand that the Kurdish political movement has focused on women’s rights for a long time. But what was the main aim for this congress, and why now? AA: It is the result of many different experiences. What happened before and after the 1980 military coup, the way Kurds suffered, the torture of women in the prisons, the first organisations of women in and outside of the prisons, all this was an important reason for the creation of a women’s association in 1991. Sakine Cansiz was one of the important symbols of this period and afterwards for the Kurdish women. And then the Kurdish political movement started to make space for women. In 2000, many different women’s organisation came together to discuss what more they could do, what kind of platform they can create to make women’s rights one of the main political aims in Kurdistan and Turkey. Almost every day and in every part of life, women have faced many barriers. Our aim is to ensure that different political and societal power-holders understand these barriers, and that they do something about these problems. It was not enough for us any more to just come together during International Women’s Day. It was not enough for us any more to just come together during International Women’s Day, or on one or two other occasions during the year. It was, and is, necessary to have a strong committee, with institutions dealing with women’s issues on a daily basis. It’s not just about focusing on specific problems and having demonstrations. It is about the creation of a new sort of politics, a new kind of education, new spaces for skill development, and equality in every part of life for women. Women make up half of any society, so at least one permanent institution should be there to deal with this half of the population, who have been excluded from politics, society and economic production for a long time. With a few sweets, half of society is still discriminated against. It is not enough to just have a few positions in lip-service. These sorts of games do not threaten the male-dominated power structure. With a few sweets, half of society is still discriminated against. These very bad political and social structures have to change. We are here to change them. All women should get involved. This is for all of us. We want to be part of the highest level of discussion, development, production, and implementation for every decision. This is the only way we can stop all violence against women. We need to destroy the politics, which justifies this violence and exclusion. NA & LT: How have your male comrades reacted to this? We know about the Kurdish co-chair system. Our previous interview with Gültan Kisanak analysed this issue in some detail. But do you think there is still a long way to go for real change? Or do you think that Kurdish men, your political comrades or men on the street, agree with you? Do they believe what you believe? AA: It’s not perfect yet, but evolution is happening in Kurdish society. It is not possible to have any definite ideas about the future. The kinds of change which will take place tomorrow cannot be guaranteed today. But our whole aim is to keep on working towards positive change. Our focus is to make pathways for these changes to happen. It may not be easy, but change will take place. If our current organisations and structures don’t make change happen, then we will keep on trying new ways to change the existing state, societal and patriarchal rules. The most important issue for us is to change old rules and habits. Whilst changing those old rules, freedom for women is the first priority of any new rules and their implementation. Öcalan has put the freedom of women before any national freedom. One way or another, we will make changes. We believe in this. We know that the Turkish state is very patriarchal. Seventy to eighty per cent of the Turkish and Kurdish population is very conservative. But Mr. Öcalan’s support of the women’s issue gives us huge power. He has also put the freedom of women before any national freedom. This perspective has helped us to make radical changes in a short time period. Of course, we have mainly discussed women’s issues with women and their organisations. Women take many decisions about women’s issues alone, without the involvement of men. This may not be enough. We need to expand our discussions to involve the whole of society if we are going to make real change. Now, we are working on this. We are planning to organise more seminars and conferences about freedom for women and gender equality and new gender roles. It may be possible, one day, to create a political party by women, for women, which can put gender issues first. We believe that the revolution starts from the involvement of each individual, and especially each family unit. If we don’t include families, how can you stop the violence? Of course, with the current levels of oppression, and under war conditions, it is not easy to keep gender issues and the new developments around this as a central focus. While a woman cannot find bread, when her house is destroyed by the state and she has no shelter for her family, it can be difficult to focus on the women’s movement and gender equality. The need for bread and shelter may easily overshadow many other issues, including gender-related inequalities. NA & LT: So, given the current war-like conditions, are gender issues being ignored now? AA: When I was an MP, at the Turkish parliament, I was part of a committee looking at the new constitution. I recognised that there are four different articles in the constitution that we want to change. The Turkish-Kurdish conflict and the interests of all ethnic groups could be resolved if these four articles were introduced into the constitution: 1.) To have a new definition of citizenship, with acceptance of the autonomy of Kurdish identity; 2.) To have mother tongue education; 3.) To accept the status of Kurdistan and Kurdish people; 4.) Pluralistic secularism. This is different from the existing arrangements. The existing secularism starts with a male understanding of gender, society and religion, while our secularism includes all different population groups. We can call it plural secularism. We could solve the Kurdish national cause in Turkey by addressing these four articles. We can call it plural secularism. However, changing gender inequality and violence against women is more difficult. Women’s rights do not depend on changing articles in the constitution. Every month between 20 and 30 women are killed in Turkey. State violence is an important contributor to violence within families. Men embody the authoritarian attitude and physical violence of the state. Our male comrades are also representing the power of the state. The freedom of women has to be a priority. Radical societal change is needed to stop this violence. Every institution, school, workplace, city council, and the government of the country have to be redesigned if we are to have positive developments. Only with this sort of collaborative work, can violence be stopped and real equality created. NA & LT: Can we explore this point? What about class? Kurds include different ethnic and religious groups and you want to make connections between these groups. You have urban middle class women and also poor, rural, and uneducated women. What about tensions or divisions between these groups? AA: From the beginning, the Kurdish movement has had three main aims: national struggle, class struggle and gender struggle. All of these three are as important as each other if we are to find a real solution for our people and geography. Three days have been considered important and celebrated by Kurdish women and men. 8 March is International Women’s Day and it is very important for our gender struggle and freedom. 21 March is Newroz and it is very important for our national struggle. 1 May is labour day and it is very important in the struggle to get rid of all class inequality. Sadly, gender, class and national inequalities have been created and used by dominant powers to more easily rule society overall. Without fighting against these three important elements of oppression it won’t be easy to create any real freedom. National struggle, class struggle and gender struggle are all as important as each other if we are to find a real solution for our people and geography. 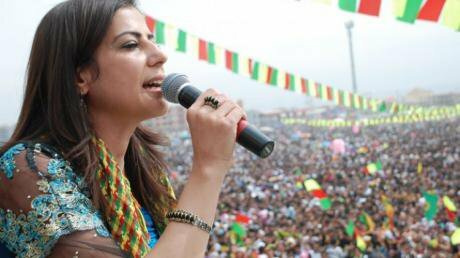 In the Kurdish movement, you can easily see a shepherd and a doctor, or a housewife and lawyer taking part together in an organisation, and acting as co-chairs for leadership positions. It may be difficult for outsiders to understand this, but this has been the reality of our women from the beginning. The national struggle may have started as the cement, but class and gender have always been a very real part of all of our work. The Turkish state and its different governments do not understand this. But we are aware of potential risks as well. If our members and their practices do not involve everyone, then there is a danger that our practice can turn into an ‘elitist’ movement, which can destroy itself. Revolutions can always be killed by their own ‘elites’. Today our revolution exists and is taking place step by step, because we do not have any class issue. But we need to continue to connect with our whole society, with young people, with different ethnic and religious movements, to include needs on the ground. As long as a movement stays connected to what is happening on the ground, that movement will not have problems. Revolutions can always be killed by their own ‘elites’. NA & LT: If your ideology is to be successful, then do you not need a stable, sustainable peace between Kurds and Turkey? Why has peace not been reached, despite many attempts during the last three decades? AA: When these power holders do not play their roles properly, then usually the world will face unresolved conflicts and wars. I believe that the world and all human beings are interconnected with each other. One person’s problem can easily become someone else’s, as we can see with the current refugee crisis. If western countries do not want to accept the arrival of millions of migrants, then they should first push for peace and stability and punish authoritarian regimes such as Turkey. It is never a good idea to just appease dictatorial regimes and their monolithic nation state structures, since these are usually the underlying source of conflict. When we look at the Kurdish movement in the last century, we can see that when states, whether it was the Ottoman state or today’s Turkish state, try to centralise power and ignore the existence of Kurds, then Kurds have risen up. Under the Ottomans, Kurds had their own autonomy. Turkey is one of the last nation states which follows the values of the French nation state. Turkey wants on the one hand to be a strong nation state with a unitary identity, while on the other it wants to be a continuation of the Ottoman Empire. They cannot be both of these at the same time. Turkey’s many problems come from this mental confusion. The lack of a clear approach for the Turkish state has been an important barrier for Turkey, if it is going to make peace with her pluralistic society, and accept the value of different ethnic and religious communities. In 1920, full autonomy was promised to Kurds, before the 1923 Lausanne agreement. But at Lausanne, they divided Kurds between four other nation states, and did not explicitly mention the existence of Kurds or Kurdistan. A nation with 40 million people was eradicated with the signatures of Lausanne. Kurds have been stateless ever since. It was not just representative of the Turkish government, but western powers too, who betrayed Kurds in Lausanne. This sad situation continues a century later. All this underlines why peace is difficult between Turks and Kurds, and why Turkey does not make any real attempts for peace. NA & LT: What do you think is needed to achieve peace? AA: In Turkey we Kurds have a legal problem with the state. We are not recognised legally or politically. Peace depends on the acceptance of, and the sharing of power between, many different identities: Kurds, Alevis, Assyrians, Arabs. As long as the government thinks of power only under a ‘Turkic’ identity, we won’t have peace. Federal states around the world, including the UK, USA, Germany and Spain, have in the end accepted their plurality and created a system according to their diversity as a way of creating peace. Turkey should follow in these footsteps. 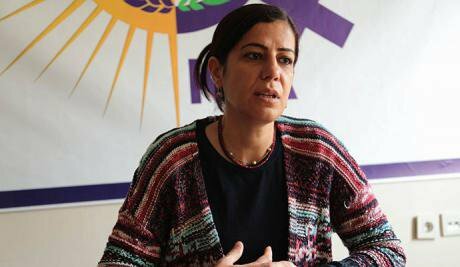 Our party, the HDP, is working for a peaceful solution. But the Turkish government system includes no peace lovers or revolutionary leaders. That is why we cannot move on from where we were a hundred years ago, why we keep on repeating the same arguments. But change is going to happen with or without the Turkish authorities. NA & LT: Is there any specific comparative case that you think can be taken as an example for Turks and Kurds? If we look at other examples, for example South Africa, then Mandela negotiated with the Apartheid regime while he was in prison. Our leader, Öcalan, has tried the same approach for many years. After his arrest he has become a leader of all Kurds. The Kurdish public sees him as their leader. International organisations, including western countries, have understood what an important role Öcalan has. He sacrificed his own freedom for the sake of peace between Turks and Kurds. That pressure and economic embargos forced South Africa’s brutal regime to take part in the peace process. But the Apartheid regime faced significant international pressure to sit at the negotiation table and talk with Mandela. That pressure and economic embargos forced South Africa’s brutal regime to take part in the peace process. There are not the same political and economic pressures on Turkey. Kurds have been left in the hands of the Turkish governments. Of course achieving peace is not going to be easy. For a real peace process, the role of international organisations such as the UN and EU, as well as other countries and people’s initiatives, are important. Different experiences can certainly help us. For example the role of the leader in South Africa, and the linkage that was made there between peace and the constitution is important. Mandela played a crucial role during the peace process and Öcalan is also actively helping the peace. But the process should be part of a constitutional change, not simply be under the control of a government. There are some similarities with the IRA movement. Some parts of the peace process in the Philippines can also be a good guide for us: it was with the help of parliament, that success happened. We Northern Kurds strongly support the Rojava revolution and the Kurdish movement’s independence in Iraq. But in the end we will create our own model. Kurdistan is divided between four areas and each area’s problems directly affects the others. The Rojava revolution has had important effects on our movement. While it is a good and operational model, that very success may be one of the reasons for the failure of the peace process between Kurds and Turks. The Turkish government wanted to destroy the revolution in Rojava because Kurds in Syria have created a pluralistic autonomous system. They are acting as a de facto federal government. Iraqi Kurds almost have an independent state. The Turkish government sees these developments as a danger to their imposed ‘unity’. They don’t hide their aims well. This is not just a policy of today’s Turkey. It has been a policy since the establishment of the Turkish Republic. We Northern Kurds strongly support the Rojava revolution and the Kurdish movement’s independence in Iraq. NA & LT: In recent years the aim of the Kurdish youth organisation is self-determination and the war they are waging in the cities against Turkish forces is another important development. This has affected the peace process and has changed the style of the war, bringing it from rural areas to the cities. Could you explain the reason for these changes? AA: The main reason for these recent developments and steps towards the creation of ‘democratic autonomy’ is the Turkish state’s approach towards maintaining a strong centralised, unitary structure and its wish to continue a colonial-type of structure under the dictatorial regime. If this structure does not change, the strengthening of this new movement in Kurdistan is inevitable. Socially, economically and politically all of Kurdistan has been ruled like colonised lands. The Kurds don’t benefit from their own local resources and are left dependent on the state for survival. Kurdish lands are rich but they are not used and managed properly. There is huge unemployment in Kurdistan. Political and economic dependency has been created by the state. Almost all parts of Kurdistan have been ruled in this way. Even though they are at war with ISIS and under a Turkish military and economic embargo, Rojava has managed to become a more developed and tolerant part of Syria now. This creates narrow political and economic options for local people and their elected representatives. The state cannot even tolerate Kurdish elected politicians, though most receive 70-80% of the public vote locally. Rojava is moving from this dependency and creating its own independent economic and political structures. Even though they are at war with ISIS and under a Turkish military and economic embargo, Rojava has managed to become a more developed and tolerant part of Syria now. Rojava’s radical developments show that if local communities govern themselves and enjoy their own autonomy, they can be in better shape politically and economically. NA & LT: The level of the war has increased and even some have claimed that it is worse than the 1990s. Was it not possible for the Kurds to insist on peace and to remain at the negotiation table? Ayla Akat Ata, Nadje Al-Ali, Gültan Kışanak. AA: The Kurds insisted and continue to insist on remaining at the table to make peace, but the state has chosen war over peace. The state uses all criminal approaches against our friends and party members who ask for greater decentralisation. Thousands of people have been killed and millions have been displaced in just one year. This war is not the reason for the failed peace process. Erdogan’s peace process façade was part of his ambition to create an authoritarian dictatorship. This has put Kurds and Turks at the edge of cliff. The state’s perspective against the Kurds has not changed at all since the 1920s. The game they play against Kurds sometimes changes, but its actual aim is to rule Kurdish lands as colonisers. This strategy is also a very easy and cheap way to increase Turkish nationalism and to create a homogenous national identity. Nationalism and an authoritarian regime are very dangerous for both sides. Kurds and Turks are walking a tightrope under Erdogan’s regime. The current war in Turkey is between the continuity of this state dictatorship and the people who are asking for a more pluralistic, democratic system. NA & LT: This means the war has not ended the Kurds’ aim of creating their own autonomous system in Turkey? AA: The Kurds will create a democratic autonomous system against the centralist, barbaric and corrupt state system. To create something better for people might not be easy, but Kurds will succeed and this will benefit Turkey and the entire Middle East. This has been part of the HDP and KJA’s programme from the beginning. This is how nations become paralysed, as we saw in Europe during the 1930s. The corrupt political and economic system, which creates an unequal approach to class and gender, will only end when local power and autonomy is achieved. We want to create a strong parliamentary system with more power given to the regions. The existence of a one-man system of rule is destroying the democratic legitimacy of Parliament and has significantly weakened it. In such circumstances it doesn’t matter how many elections you have, democracy is merely reduced to a rubber stamp for dictatorship. Sadly a Turkish nationalist block exists and supports this type of dictatorial rule. This is how nations become paralysed, as we saw in Europe during the 1930s. However the Kurds’ fight is against such an undemocratic and unaccountable system, and our success will also allow the Turkish people to achieve a truly democratic and equal system.